The Offices of Dr. Mehta & Associates are fully equipped with ground-breaking CEREC technologies (Chairside Economical Restoration Esthetic Ceramics). Consequently, instead of taking weeks to perform crowns or restorative procedures, we can finish them in an hour. That’s right! A permanent tooth solution is achieved during one dental visit. If you have metal filling, cracked, or damaged teeth, our cosmetic CEREC procedure is the best solution. This dental procedure is available at our offices in Riverside, and Temecula. 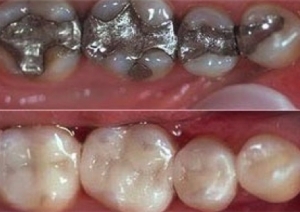 The times of using unsightly metal fillings and precious metal tooth replacements is over. CEREC enables you to have pearly white restorations rather than unsightly metal ones. Let’s see how. The process begins with photographing and storing a 3D digital image of the tooth’s cavity. The approximate shape and size of the restoration is formed by software that the composition of your other teeth. Afterwards, the restoration model is examined and refined by our dentists via 3D CAD programs. We pay attention to meticulous details that improve the function of the model. Next, the model comes to life when it is milled by the CEREC. 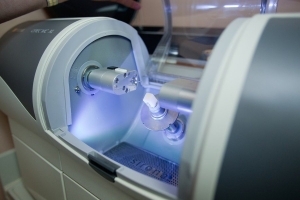 Inside of the machine, diamond-head cutters work with laser precision to shape a block of tooth-colored ceramic. This process is lightening quick (preparing the patient for the procedure usually takes longer than creating the restoration model). When the model is crafted, we’ll bond it to the tooth with a special resin. Dr. Mehta & Associates have had tremendous success with CEREC restorations. Apart from the beautiful smile that is possible through CEREC, the durability of the restorations are simply amazing. Over 28 million restorations had been preformed using CEREC and the procedure has proved to have long-term resilience. We are proud to give our patients the option of CEREC. Nevertheless, we understand that technology will always need the human touch. Therefore, we carefully weave technological dental engineering with kind, professional service. Although we want you to have a beautify smile, we equally desire your experience to be a relaxed and healthy one.